What Does Redeemed Or Redemption Mean When Used In The Bible? What does the word “redeemed” or “redemption” mean when used in the Bible? The word redemption means to gain something or to regain possession of something in exchange for a payment either by paying it off or by paying in full some amount owed for the possession. I used a voucher at the airline counter to indicate that I had already paid in full the amount of the airfare, so I took my voucher and redeemed it for the boarding pass at the airport, therefore I had a full right to board the plane because I had exchanged money for the right to acquire or possess a seat on the plane. Biblically, it is used as a way of describing a clearing of debt, in our case, the debt that our sins had incurred for which our own payment received would have been the very wrath of God. As sinners, our sins will have to be paid for in one way or another. Isn’t it better to have Christ’s atonement satisfy the wrath of God rather than for us to pay for our own sins in hell? As I wrote, one way or another, our sins will have to be paid for; either by Christ or by us, and since we cannot ever pay for our own sins by our own suffering, this sin-debt will require us to face the wrath of God for all time. For everyone, redemption is only found through Jesus Christ. The Greek word for “redemption” is “agorazo” and was commonly used when referring to purchasing something in the market place. In ancient times, a slave was “redeemed” (agorazo) by a sum of money. 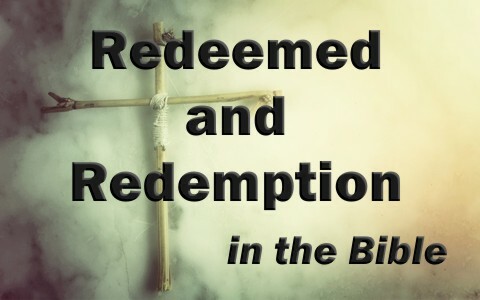 Christians see redemption is a necessity in order to enter the kingdom of God but to also remove the wrath of God that had been previously abiding on us (John 3:36b). Why do we need Redeemed? The question by unbelievers is, “Why do we need redeemed? There’s nothing wrong with us,” and most would even say, “They’re a pretty good person,” however, Scriptures tell us what is really true and that is none of us are good at all, not even one of us, and none of us can even seek God on our own (Rom 3:10-12). Indeed, every human ever born has fallen far short of God’s glory (Rom 3:23). The only thing we’ve done is earned wages that require our eternal death (Rom 6:23), so you can see that we have a serious sin problem. Our sins have separated us from a holy God (Isaiah 59:2). Until the sinner understands the truth that none of us are good and we all deserve God’s wrath, they will not seek the forgiveness that’s necessary (1st John 1:9) and that all we are doing before repentance and faith is storing up God’s wrath against the day of His visitation (Rom 2:4-5). That’s when God will judge everyone according to their works (Rom 2:6; Rev 20:11-15) and that’s very bad news. If people don’t see that they are not good at all, and only God is good, then they will never see their need for the Savior. Of course, it is God alone Who grants repentance and the ability to trust in Christ, but we do cooperate in the sense that we must see ourselves as depraved sinners who are unable to save ourselves by any number of good works (Eph 2:8-9). Clearly, Jesus is referred to as the Redeemer because there is salvation found in no other Person or in no other way than through Jesus Christ (Acts 4:12). If you have trusted in Christ, then you realize (hopefully) that at one time, we “were dead in the trespasses and sins in which you once walked, following the course of this world, following the prince of the power of the air, the spirit that is now at work in the sons of disobedience” (Eph 2:2-3). Since we were “dead men walking,” we had to be made alive in Christ because it is only “In him we have redemption through his blood, the forgiveness of our trespasses, according to the riches of his grace” (Eph 1:7). The law of God should have shown us what sin is (Rom 7:7), and knowing that we’re all guilty of cosmic treason against God, we stood as convicts condemned to die, as if on “death row,” but “Christ redeemed us from the curse of the law by becoming a curse for us—for it is written, ‘Cursed is everyone who is hanged on a tree’” (Gal 3:13). He paid a debt which He did not owe for a debt we could never pay in a billion lifetimes. That’s grace my friends. That’s redeeming grace in fact. That Jesus “gave himself for us to redeem us from all lawlessness and to purify for himself a people for his own possession who are zealous for good works” (Titus 2:14), should cause us to walk in the good works that God has planned for us to walk in (Eph 2:10). Even the ancient Israelites were said to be redeemed by God from the hands of the Egyptians (Ex 6:6), so all glory must be ascribed to God for He alone redeems for what could otherwise not be. The redeemed are those who understand that Jesus Christ “entered once for all into the holy places, not by means of the blood of goats and calves but by means of his own blood, thus securing an eternal redemption” (Heb 9:12), so the continual animal sacrifices only pointed toward the coming total and supreme sacrifice of Jesus Christ Himself and was needed only once and for all. These old sacrifices never took sins away…they only covered sins, and why they had to be repeated over and over again since humans sin like creatures drink water. This is why it is only through Jesus Christ “in whom we have redemption, the forgiveness of sins” (Col 1:14). Who are the only ones who can enter the kingdom? It is only those who “have been redeemed from mankind as firstfruits for God and the Lamb” (Rev 14:4b). This was not only a New Testament belief, but even the ancient patriarch Job said “For I know that my Redeemer lives, and at the last he will stand upon the earth” (Job 19:25). At the end of this age, you will either stand as one of the redeemed or as one of the condemned who will regret for all time their rejection of Christ since they had no excuse; they knew of God’s existence but simply suppressed this knowledge (Rom 1:18-20), so no one can plead ignorance. If God has never brought you to a time and place of repentance, meaning that you have seen the need to forsake your sins and then put your trust in Christ to pay for your sins, you are not redeemed and will have to pay for your own sins (Rev 21:8). There will be nothing more horrible than this. The Apostle John put it this way: “Whoever believes in the Son has eternal life; whoever does not obey the Son shall not see life, but the wrath of God remains on him” (John 3:36). If you have never trusted in Christ, then you have not been redeemed, and without the Redeemer’s work in your stead, you must face an eternal separation from God while receiving the full wrath of God without end. In one of the most fearful verses in all the Bible, the Apostle Paul warns of the unrepentant, Christ-rejecters, that “when the Lord Jesus is revealed from heaven with his mighty angels in flaming fire, inflicting vengeance on those who do not know God and on those who do not obey the gospel of our Lord Jesus” (2nd Thess 1:7-8), and “They will suffer the punishment of eternal destruction, away from the presence of the Lord and from the glory of his might, when he comes on that day to be glorified in his saints, and to be marveled at among all who have believed, because our testimony to you was believed” (2nd Thess 1:9-10). Thank you Richard. All glory to God, for sure. Beautifully stated Pastor Jack. A question might be asked, “which comes first, belief or repentance”? Would you argue that conviction comes first to spur our understanding of our position. That position being our separation and lostness from God and subsequent destination….hell? But understanding or conviction is not belief is it? One might feel guilty or ashamed for being caught by the police, but that is not the same as penitent either, is it? After much soul searching I believe that true salvation involves a sovereign move of the Holy Spirit which involves conviction in the heart of the individual which includes both belief and repentance at the same time. If not simultaneously, very close. An example would be in Acts on the day of Pentecost when the hearers of Peter were convicted and asked what they should do. Am I wrong here? I would love to hear your thoughts. Thank you Doc. I do see your point my friend. Conviction comes, as you said, from a move of the Holy Spirit. Unbelievers don’t know this conviction because they don’t have the Spirit working in their hearts to soften them. Very great food for thought Doc, I like to look to Ephesians 1:12-14 for what comes first (bearing in mind that repentance is the English word for the Greek metanoia, which means “change of mind”). So then, I believe repentance comes when you hear AND then after you believe Holy Spirit indwells you and now you are able to “sin” “less” … not that we ever become “sinless” this side of heaven. Also, Holy Spirit is Who even allows us to call Jesus our Lord (1 Cor 12:3). Conviction comes from the Father, according to the Bible (John 6:44). You said it better than I did. thank you Pam. I love how Doc loves to dig deep into the Word and this shows me that this precious brother in Christ has a hunger and thirst for God. I thank God for Doc and for you too my beloved sister in Christ. Thank you Pam and Pastor Jack. Your words are well received. Thank you Doc. Keep us on our toes bro. No one is above correction. there are hundred and three verses in context,of referring and agreeing with all redeemed,in the bible,yet Christians are so,churchified,I call them,they cannot,conceive the concept of all redeemed,by Jesus Christ at the cross.They are so manipulated and controlled by the church,there afraid to believe in the freedom of knowing their already redeemed,by Jesus at the cross,without having to believe to get redeemed. Thank you so much. I hope you don’t mean all churches as it sounds like in your comment. This is true in some cases, but most churches do not control their people like that. Maybe yours did, but not all. Who would be afraid to believe? Wow. Please don’t make it sound like “Christians are so churchified” which you know that is not true of them all. Previous post: Why are Eastern Religious Practices So Popular Today? Next post: Why Did God Create Outer Space?